Full-time at The Crabble following a 5-0 home win for the mighty Dover. My first time down there to see my dad's old local team and a huge contrast to watching Manchester City each week. As the ground is built into a hill, it's only routine to have a few lost ball incidents during a game (on the side with a steep drop), but it's fine as long as you have a few spares. 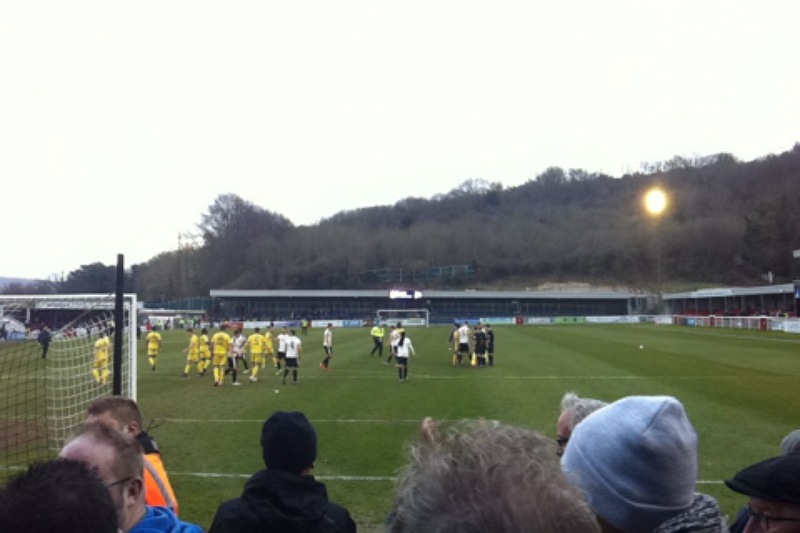 Dover are pushing for promotion into League 2 so a large crowd of 1300 was drawn and the atmosphere was arguably better than at some Premier League matches. They look like they might be lacking the squad depth to go all the way up though, getting beat 3-0 at 19th placed Boreham Wood 2 days later. Still, come on you Whites.